In light of recent events I took a look at the above diagram of the semantics of social and information connections and noted relative scenarios to my previous and current standing. Analysing the information which covers the last three decades, comparing my timeline and the evolution from the PC Era. All starting in the eighties with the introduction of DOS, the Internet back then was in it's infancy just as I was as a child. Trying to establish myself in the same way that developers were building the architecture that would eventually become the Internet as we know it today. The World Wide Web evolved and led to the "dot-com bubble" which was a speculative bubble covering roughly 1995–2001. This was around the period that I was leaving school and looking to make an impact on the World. As Web standards were introduced, I too had to adapt and accept responsibility as I matured into an adult. The timeline above depicts the Internet in stages (Web 1.0, 2.0... etc) I can relate to this instance by describing my relationships which (sorry girls) I count as two of significance. From the first relationships I have two start ups, both are now at school and are adapting to the challenges of life. This relationship came with it's bugs and incompatibility so the program instance ended. I remained backwards compatible as there was no way that I was going to distance myself from my children's development. Although not in the same instance the dot-com bubble burst and many dot-Com's ran out of capital and were acquired or liquidated. The crash wiped out $5 trillion in market value of technology companies from March 2000 to October 2002. I also found myself in financial difficulty as I absorbed the 'bad-debt' from the relationship and had to adjust to being apart from my children. Web 2.0 describes the changing trends in the use of World Wide Web technology and web design that aim to enhance creativity, communications, secure information sharing, collaboration and functionality of the web. Tim Berners-Lee, inventor of the World Wide Web, has questioned whether one can use the term in any meaningful way, since many of the technology components of Web 2.0 have existed since the early days of the Web. 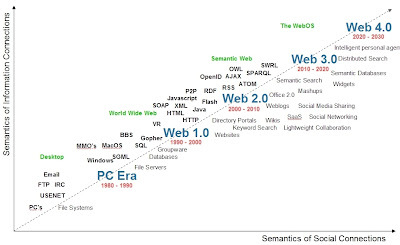 Web 2.0 encapsulates the idea of the proliferation of inter-connectivity and interactivity, my current relationship reflects the Semantic Web and allows for cross platform connectivity. I met my current partner through the social networking site MySpace and we have had some really dynamic adventures. At times it has proved to be difficult as we both have children from previous relationships but we have held it together. We also have our 1.0 partners, their new relationships and other factors so it's very widely spread. Just like the current crop of social media tools, threaded posts/comments and variant platforms. It's one voice interpreted many different ways, with multiple outcomes! Underneath this Live Mesh you will find us in digital form but instead of being able to sync, share and express ourselves we aren't displaying the required creativity that either of us deserve. The continued uncertainty over the global economy has been a worry and has been building steadily over the last few months with the World markets heading into recession. In my previous relationship the underlining issue was being unable to find the funds. This is presently something I hear echo through the press daily with the economy but unlike before I now have a reluctance to spend. It's not going to solve the problem - just look at the Governments throwing money away - but it does create unnecessary tension when we should be working together. I have seen many indications that the Web 2.0 era is over but also signs that it has momentum. Maybe I'm already in the cloud computing but I am not ready for a WebOS because I feel that there is real potential and the ability to change the decline.